Prototype: Norwegian State Railways NSB class El 12 heavy orelocomotive as a 2 part side rod electric locomotive. Used on the ore line Lulea Kiruna Narvik. Road numbers 2113 2114. Olive green basic paint scheme, largeheadlights, engineer's cab doors in the old arrangement, large snow plows Norrland plows and spoked wheels. The locomotive looks as it did around1970. Model: The locomotive has an mfx digital decoder and extensive sound functions. It also has 2 controlled, high-efficiency propulsion systems with flywheels, 1 motor in each locomotive unit with an engineer's cab. All 4 driving axles powered in each locomotive unit with an engineer's cab. Traction tires. The dual headlights and a red marker light change over with the direction of travel, will work in conventional operation, and can be controlled digitally. An additional third wide beam headlight above on the locomotives can be controlled digitally. The engine room lighting as well as the cab lighting in Engineer's Cabs 1 and 2 can each be controlled separately in digital operation. An additional marker light can be controlled digitally. The lighting is maintenance-free warm white and red LEDs. This locomotive has highly detailed metal construction with many separately applied details. The roof equipment is detailed with large vent attachments and compressed air tanks. Both locomotive units are permanently coupled together. 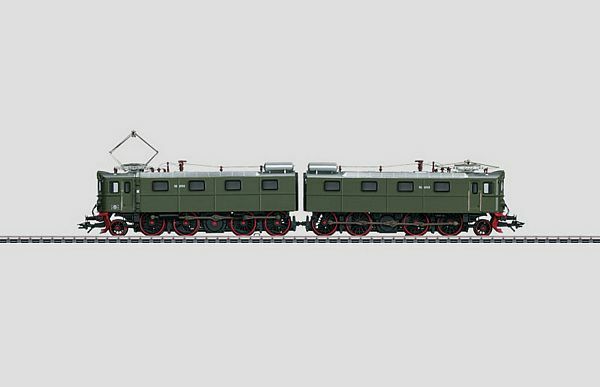 There is a close coupling mechanism between the locomotive units. Marker signs for the front end of the locomotive are included separately. Length over the buffers 29.0 cm / 11-7/16". Completely new tooling for the two-part El 12 ore locomotive. mfx decoder with extensive sound and light functions. 2 high-efficiency propulsion systems with flywheels, 1 motor in each locomotive unit with an engineer's cab. Engineer's cab lighting and engine room lighting can be controlled separately in digital operation. Item numbers 46370 and 46371 ore car sets to go with this locomotive, cars with different car numbers, for a prototypically long ore train. The ore cars to go with this locomotive can be found in two sets, each with 6 cars and different car numbers, in the Marklin H0 assortment under item numbers 46370 and 46371. Two ore car sets with other different car numbers can be found in a DC version in the Trix H0 assortment under item numbers 24237 and 24238. This ore locomotive can be found in a DC version in the Trix H0 assortment under item number 22274.